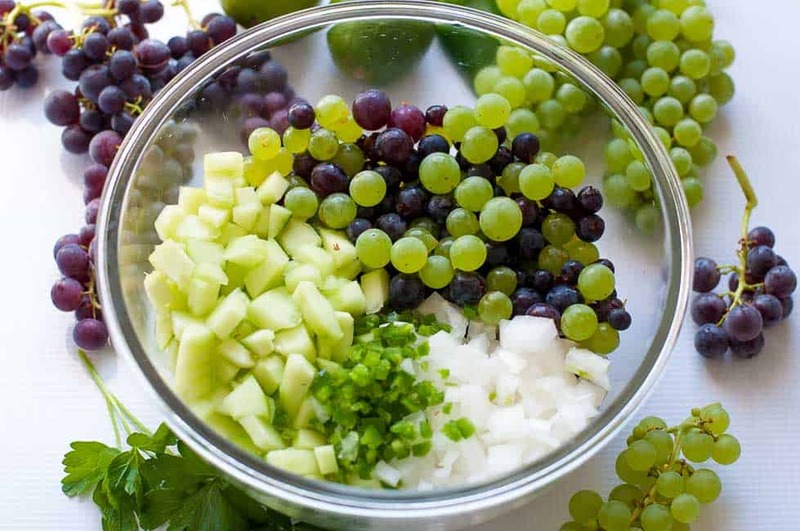 Grape Salsa with Lime and Cilantro is a refreshing change! 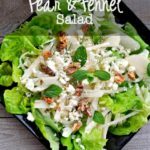 It’s great with chips, or as a topping for grilled chicken or fish. Vegan, Paleo and Whole30 compliant. Grape Salsa with lime and cilantro. It sounds like an odd combination, but it’s insanely good. 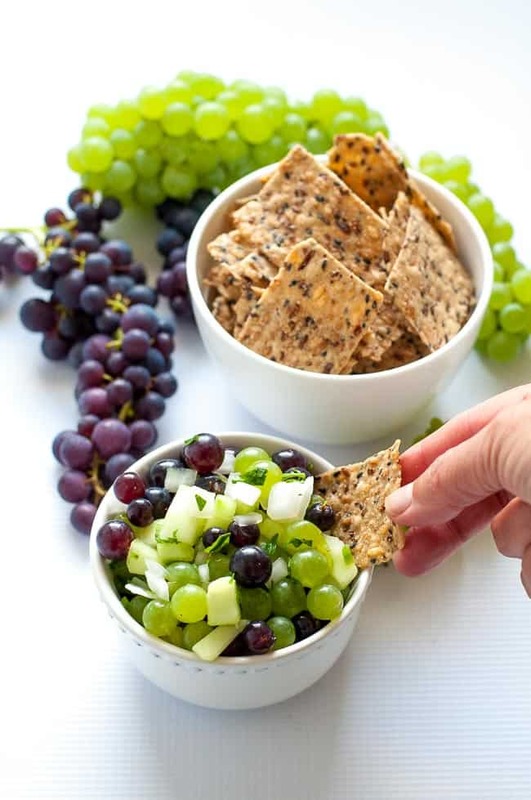 Sweet and tart grapes, crisp cucumbers, onions and zippy jalapeño peppers make this salsa one that you’ll keep on dipping. It’s quick to whip up, too. Just chop, squeeze some lime, refrigerate, and serve. 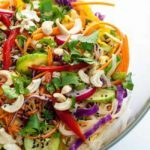 Just like this Grape, Apple and Red Cabbage Slaw, this recipe is a great way to use up those leftover grapes in the fridge. 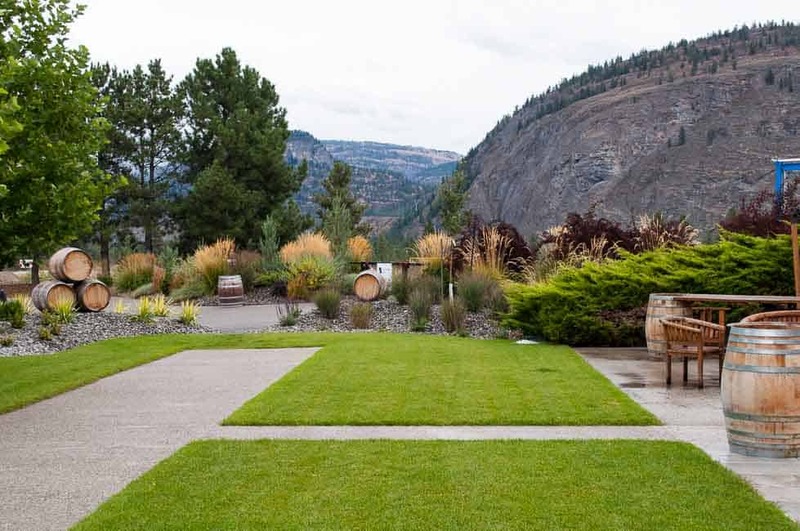 On a recent trip to Kelowna in the Okanagan Valley, Denis and I had a good laugh about one of our past trips there. We had set out to take the kids to the Royal Tyrrell Museum of Palaeontology in Drumheller, Alberta. The kids were at the age where they were fascinated with dinosaurs and fossils. We were going to be great parents and provide a rich learning experience for our offspring. I have fond memories of childhood camping trips with my parents and my brothers, and I desperately wanted to re-create these with my own children. Before this particular trip, our friends joked that they could predict the weather for the dates of our upcoming campouts. And it seemed like it always did. Camping to Denis simply meant a daily struggle with wet tents, wet tarps, wet firewood and trying to pound plastic tent pegs into ground that was hard as concrete. And this particular trip to Drumheller was no different. We found a campsite, battled high winds to pitch the tent, and had just succeeded in finally getting the camp stove lit when the park owner arrived to tell us that the tiny patch of lawn where we were set up was actually two sites and we would have to move over. By this time, the winds had increased and the rain was coming down in sheets. We moved over. “Never mind, I told the kids. You can go swimming in the pool after dinner.” They ran off with their towels, only to return minutes later. Adults only after 7 p.m. Could this day get much worse? Yup. Neither could we. First thing in the morning, I picked up my phone and booked a hotel with a swimming pool in Kelowna. We never camped again. 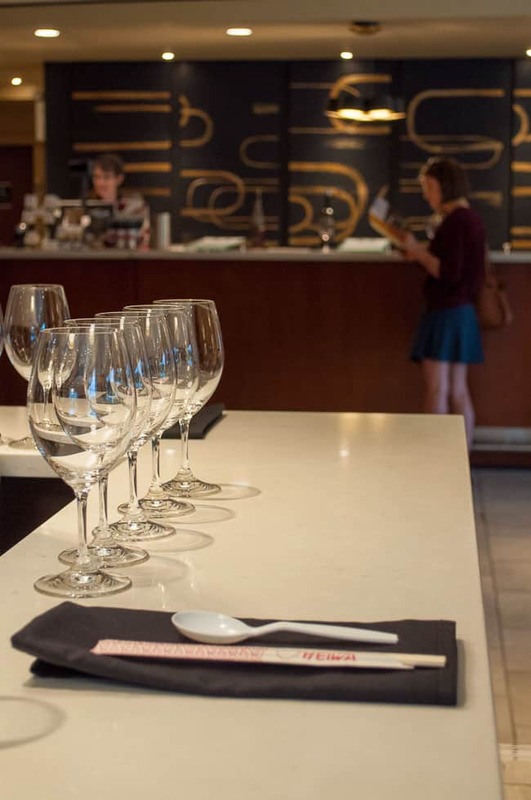 Our most recent trip centred on vineyards, winery tours and fine dining. No tents, Rice-A-Roni, or noisy neighbours. It’s always fun to be adventurous and try new foods when we’re traveling and we did just that. 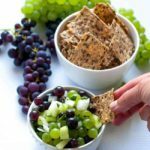 Driving through vineyards inspired me to create this grape salsa, and it was a great way to use up some of our bumper crop of Concord grapes. I hope you’ll give it a try! 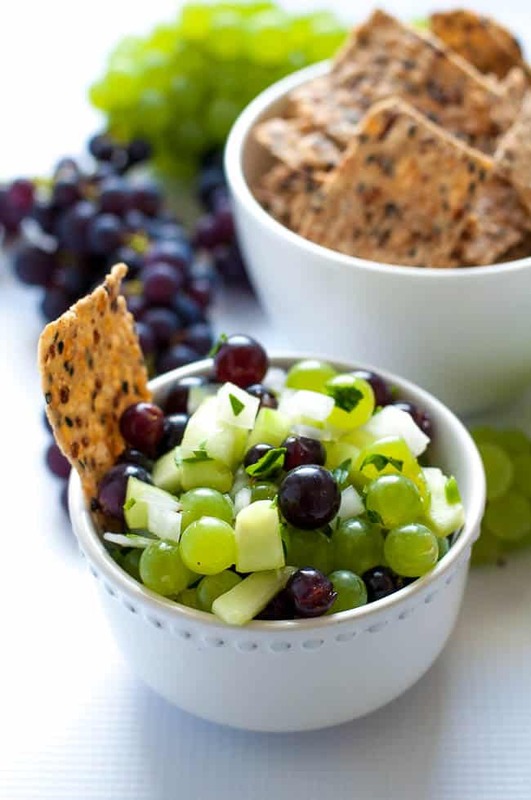 Grape Salsa with Lime and Cilantro is a refreshing change! It's sweet, tart and zippy. It's great with chips, or as a topping for grilled chicken or fish. Refrigerate for 30 - 45 minutes to allow flavours to blend. Serve with sturdy chips or with grilled fish or chicken. The grapes I used were home grown and small, so they didn't need to be sliced. 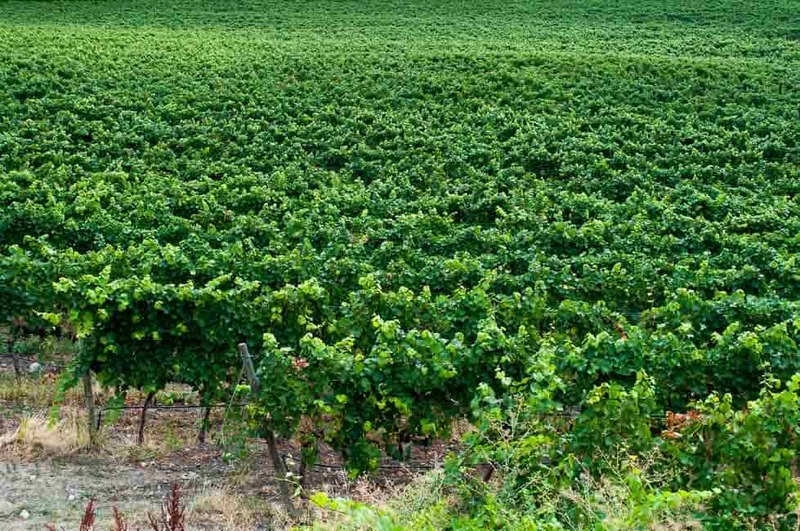 You may find you will need to halve or quarter the grapes. Salsa Fans! 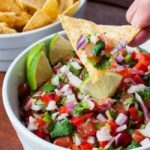 Try these salsa recipes too! I use this glass herb keeper to keep my herbs fresh. So often I find that a recipe will call for a small amount of cilantro, and yet it is usually sold in bunches. This herb keeper has paid for itself several times over. 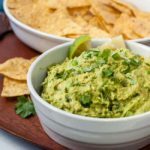 No more slimy cilantro to throw out! This post contains affiliate links. If you click on any of the affiliate links and make a purchase within a certain time frame, I’ll receive a small commission. The commission is paid by the third party, not by you. Flavour & Savour is a participant in the Amazon Services LLC Associates Program, an affiliate advertising program designed to provide a means for sites to earn advertising fees by advertising and linking to amazon.com. While there are several recipes for Grape Salsa on Pinterest, I was inspired by this one from The Kitchen is My Playground and changed her recipe slightly. It’s too bad that you weren’t able to go to the Royal Tyrrell Museum 🙁 I went once and it was pretty cool. I’m not really camping person though – we drove from Ontario! Your grape salsa looks so beautiful and fresh, I’m pinning it for later. Oh, we did get to the Museum, and it is incredible! Definitely worth a visit. That’s a LONG drive!! Thanks for pinning! Hope you get a chance to make it. 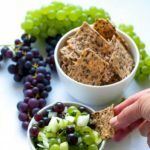 Indeed a great way to use up grapes! This is such a fun recipe and the taste would be such a great collaboration of sweet and tart. As a bonus is looks great too! Elaine, you’re always coming up with the coolest snack ideas. I can’t wait to try this. 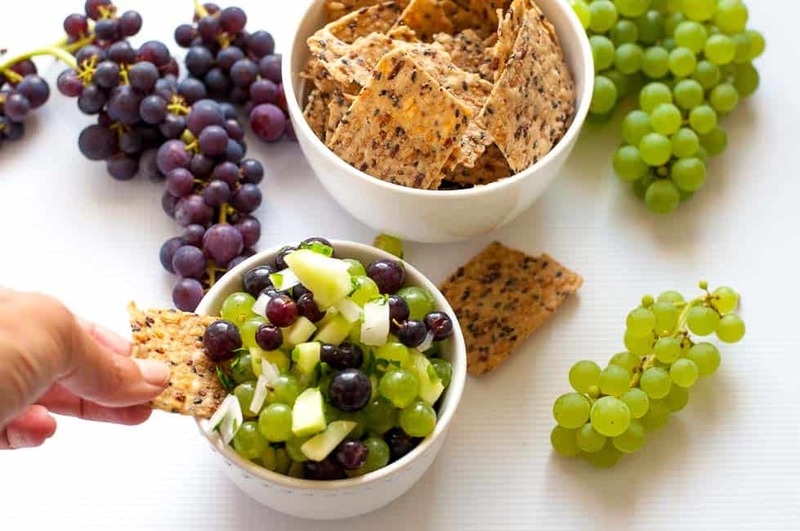 My husband and I lovelovelove green grapes and munch on them constantly. I also happen to have some jalapenos in my fridge. I might whip some of this up this weekend/next week! Hope you get a chance to make this–it’s a great change from traditional salsa. Cheers! I am still laughing at the camping story! After just getting back ourselves from 8 nights in a tent, i can totally relate to all of it! The salsa looks great. I always think of savory salsas but the great idea looks great! No more camping for this girl! Yes–this salsa is sweet and tart at the same time. We loved it. Really love the look of this salsa, and I bet it tastes so good you cannot stop snacking on it! I camped just once in Sicily when I was young and never again 😉 . Well, this salsa is museum-worthy! It’s so creative and pretty. This is a great idea and sounds wonderful. I totally want to try this recipe. It’s got everything I like, sweet, salty and spicy. Sounds like a balanced dish. Yum! Thanks Jared! It’s a great change from traditional salsa. oh GOSH! I am SO with you. I hated being uncomfortable camping in a tent and now we have a tent trailer. All the fun of a tent with a comfortable bed and a little more room in case of crappy weather. I have a grape salsa recipe too but adding cucumbers seems like a great idea! Tent trailers are a great alternative to lying on the cold ground. I think we may have almost crossed paths lately in the Okanagan! We just arrived home from a short trip to Nelson and Kelowna.